This Saturday, December 3, welterweight MMA fighter and top rising prospect Ryan Quinn returns to the cage as he battles against former UFC fighter Ricardo Funch at The Premier Fighting Championship 7. 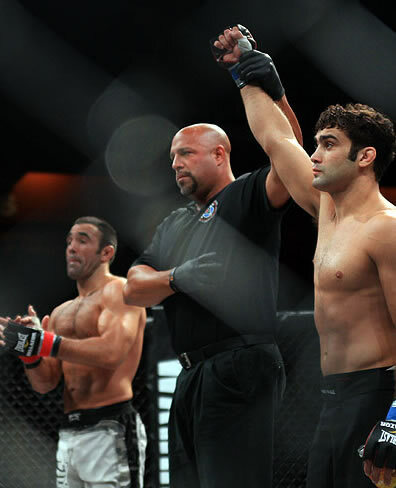 Quinn (7-2-1, 1 KO, 2 submissions) is an undefeated 3 time Bellator fighter and has quickly been climbing up the ranks in 2011, going unbeaten at 3-0-1. Since his loss to Ian Stephens in 2010, Quinn has come out the gate looking like a different fighter, improving each time he steps through the gate of the cage. I had the opportunity to watch Ryan Quinn in action in his first fight following the defeat to Stephens, and that was the jumpstart he needed to get back on track. Quinn won that fight by way of TKO in round 2, and hasn’t looked back since. A soft spoken class act with the skill, determination and drive to become world champion one day, Quinn is looking to make an impact Saturday night and continue his winning ways. I had the chance to talk to Ryan about his upcoming fight, his impressive 2011 inside the cage and what lies ahead for the young welterweight. Ryan, 2011 has been a great year for you so far. You’ve won big fights over top fighters, and continue to excel. What do you attribute to your ongoing success inside the cage? "I have recently moved to South Florida to train full time at American Top Team headquarters where the quality of training is second to none and is pushing me and outright forcing me to become a better fighter. Bust most importantly, I have the best support system ever. Starting with my family who haven’t missed a bout since I was in my first wrestling singlet; my girlfriend Stacy who is always behind me 100% and my friends and team who keep me going and push me to limits I never dreamed I’d reach. Having people like this around me make the hard work seem not so hard. I am truly blessed I having the best fans in the world." Ricardo Funch may be one of your toughest tests to date, and that seems to be a recurring theme with you. Does your game plan change against a strong striker like Funch or do you prepare the way you do for other fights? "I didn’t change much in my training schedule. I always go as hard as I can and pay strict attention to detail in training sessions. However, this fight I really not to stay focused and stick to the game plan we put together or he will end it. I haven’t had a conversation about anything but the fight with my coaches in the gym for over a month now. It was like I was being treated as a pitcher throwing a no-hitter or something. Very strict camp, because this has to be a very strict fight." This is your 4th fight of the year. Going forward do you plan on staying active in the oncoming year? "As long as I am healthy, I want to compete. I was even looking at a wrestling tournament a couple of weeks after the fight. The more I compete the harder I train and the sharper I feel." "I would like to thank my sponsors Overthrow Gear, Mayhem Inc., Prime Fitness, Physical Medicine and Rehabilitation of NY and CT, O’Connor’s Public House (where the after party will be) and T.R.I. for Alice—my friends organization that compete in triathlons and events for fundraising for Huntington’s disease. And all of my team, friends and family for all their support." Best of luck to Ryan Quinn Saturday night and everything going forward in his career. v The Premier FC 7 takes place on Saturday night, December 3 at The Mullins Center at UMass in Amherst, MA. v Tickets for The Premier Fighting Championship 7 is available at ticketmaster.com by searching the event “Premier FC 7” on December 3 at UMass. Be sure to type in “Quinn” where it says code.